Well, I've made it through seven days of house arrest. And I haven't gone (totally) crazy... yet. I did lose it on Josh, the Shaw Cable employee who suggested that while I was waiting for a tech to come and fix my broken PVR (which is probably the worst thing to happen when you are stuck at home), that because I had another cable unit in another room that I may want to move that one to my bedroom. Yeah - I can't even bathe myself, and you want me moving cable boxes around my house because you have sub-par technology that breaks at least once per year? Let's just say that I have a different company coming in to install cable and internet on Thursday. But really... I'm doing okay. My friend Sarah sprung me from my condo for a couple of hours on Sunday to do some grocery shopping and to eat some tasty Vietnamese food (and my arms are still hurting more than 24 hours later from crutching around - Safeway is HUGE!!)... I tell you, I've got some great friends. I mean I knew that before I broke my leg, but I really know it now. 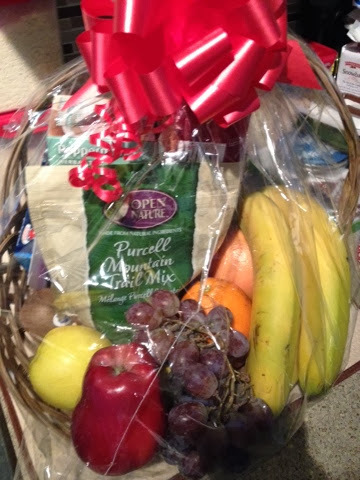 And the people from work sent me a fruit basket so I won't get the scurvy. Seriously though... I'm not really a flowers person, but I've been shoving fruit down my throat for a few days now and I can only imagine it's helping with the healing process. Fruit baskets are a win in my books! Now... I only have seven more days until my follow-up appointment where I'm hoping the orthopedic surgeon tells me I have supernatural healing powers and I can move to a walking boot and start physiotherapy soon! !